GoPawty is a chatbot for users to get personalised content to manage their pup’s life effortlessly. It revolves around 4 primary needs - Scheduling, Training, Tracking and Networking. It aims to help users achieve a good balance in their pups life and sends them recommendations based on various factors like age, breed, activity level, medical conditions. GoPawty was first conceptualised as a mobile app, the transition from App to chatbot raised many questions and ideas for maintaining consistency and creating a user friendly design. In terms of content creation for the Bot - There are different methodologies for training, catering to existing medical conditions, preventative care and recommended schedule. Equipping this app to take into consideration the owners calendar and availability and understanding their mindset in terms of providing for their dog often involved too many parameters to return a simple yes or no result for queries. Translate a Mobile App into a Chatbot while retaining essential functionality. Scope potential user flows along with edge cases and drop off points for users engaged in the ChatBot experience. Compare and combine features that increase usability to create a cohesive yet simple User Experience. Determine feature sets that will be scheduled for future versions and those that are required for creating a Minimum Viable Product. My experience in volunteering at the Seattle Humane (S.H.) and being a dog owner helped me recognise the need for an integrated social platform. I conceptualised a mobile app with a minimalist interface and created a Chatbot for users to receive personalised solutions in real-time. Collaborated with volunteers at S.H. to develop engaging content for the chatbot while parallely testing the product with target groups. Listing features according to build capability and shortlisting features required for creating an MVP were paramount in the initial phase. A mindmap of all features was made along with a basic wireframe of the app with all features. The App was then scaled down to the MVP requirements and a Lo-fidelity prototype was created on Axure. A mobile App is very different from a Chatbot. Comparing the quantitative and qualitative differences between an App and a ChatBot made our decision making process a lot easier. While ChatBots required an initial on boarding education on where the menu and account options were located, its reach across the target demographic was better. What it lacked was an interface that was easy for the user to interact with. The aim is to make GoPawty a friendly messenger app that acts as a scheduler for managing your dog’s life. Receiving inputs via messaging is a friendlier solution especially when expanding to a NLP based bot in its later stages. Initial Decisions: What Type of ChatBot Should we build for v1.0? The prime factors that influenced this decision of a conversational vs linear type of Bot were Existing Infrastructure, Developmental capacity, study of various scenarios and edge cases and a study of current bots in the conversational sphere. While the prospect of creating an NLP based bot was more futuristic and appealing, the current needs for v1.0 were more accurate y satisfied by a conversational but streamlined bot. After mapping a comprehensive set of potential conversation flows, a meeting scheduled with the development team to discuss scope, level of effort, and feasibility for v1.0. Based on our decisions, some of the more advanced functionality that was not required for the MVP was moved out and slated for development in the future. Creating a subtle tone of voice is a primary need for a ChatBot. GoPawty focuses on a clear yet friendly approach that Involves a few “pet-friendly” phrases. Introducing subtle dog references emphasizes the tone and brand of the Bot. 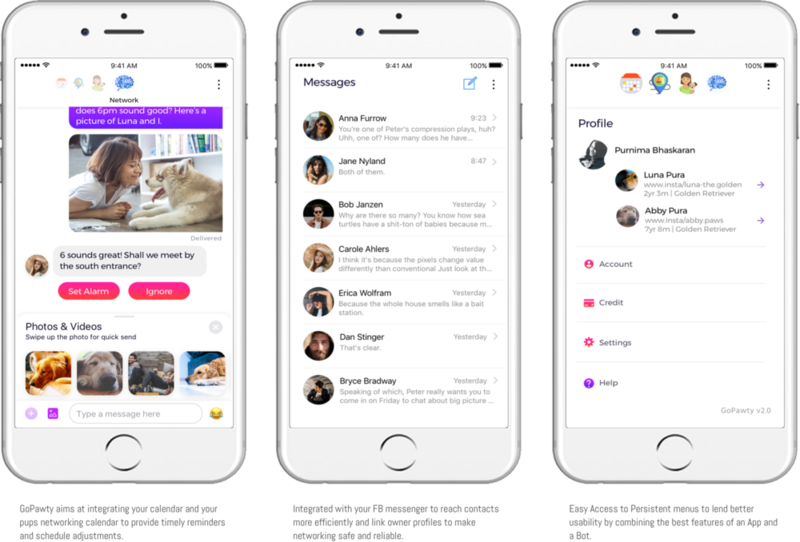 The MVP version is set out as a Facebook messenger Bot, however future versions once a critical number of onboarded users is reached, the Bot is to be migrated to achieve greater functionality. Creating a Branding and Voice guideline established the tone and interaction story points for the ChatBot. Defining strong brand colors and creating tonal values and color guidelines helped establish brand identity and color. Messaging fell into distinct categories in a Linear flow. Introductory Actions or Message triggers that prompts a user for data/choice. System Actions that triggers an action when a secondary action takes place. User actions triggers when the user completes an app action. v2.0 aims at breaking away for the Facebook Messenger interface to create a Bot that exists similar to a web based ChatBot that is linked via a unique site - particular to the GoPawty Brand. It aims at creating a Bot that is NLP based, has a Fluid decision engine and applies conditional logic. It also aims at developing the product to fit price plans that can be purchased based on features and aims to combine the best aspects of app and bot design. Note: The above mockups are for representation purposes and design/prototyping is still in progress.